The organ toxicity of lanthanides (Ln) on organisms had been recognized, but very little is known about the oxidative injury of brain caused by Ln. In order to study the mechanisms underlying the effects of Ln on the brain, ICR mice were injected with a single 20 mg/kg body weight dose of LaCl3, CeCl3, and NdCl3 into the abdominal cavity daily for 14 days. We then examined the coefficient of the brain, the brain pathological changes and oxidative stress-mediated responses, and the accumulation of Ln and levels of neurochemicals in the brain. The results showed that CeCl3 and NdCl3 could induce some neurons to turn inflammatory cells and slight edema but did not observe the brain pathological changes from LaCl3-treated group. The concentrations of La, Ce, and Nd in the brain were significantly different and ranked in the order of Ce, Nd, and La. The injury of the brain and oxidative stress occurred as Ln appeared to trigger a cascade of reactions such as lipid peroxidation, the decreases of the total antioxidation capacity and activities of antioxidative enzymes, the excessive release of nitric oxide, the increase of glutamic acid, and the downregulated level of acetylcholinesterase activities. 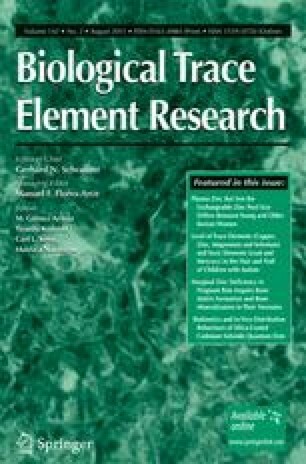 Furthermore, both Ce3+ and Nd3+ exhibited higher oxidative stress and toxicity on brain than La3+, and Ce3+ caused more severe brain injuries and oxidative stress than Nd3+, implying that the differences in the brain injuries caused by Ln might be related to the number of 4f electrons of Ln. Haiquan Zhao, Zhe Cheng, and Renping Hu contributed equally to this work. This work was supported by the National Natural Science Foundation of China (grant No. 30901218), the Bringing New Ideas Foundation of postgraduate of Medical College of Soochow University, the Medical Development Foundation of Soochow University (grant no.EE120701), and the National Bringing New Ideas Foundation of Student of China (grant no.57315427, 57315927).